DIABETES ALERT DAY: America, Take the Test! One in three American adults is at risk for developing type 2 diabetes, so on March 27 the Lake Cumberland District Health Department encourages you to take a quick (and anonymous) one-minute test to find out if you’re one of them. By understanding your risk, you can take the necessary steps to help prevent or delay type 2 diabetes. Why is American Diabetes Association Alert Day so important? An estimated 86 million American adults have prediabetes, which means they have blood glucose (sugar) that’s higher than normal. People with prediabetes are at risk of developing type 2 diabetes unless they take immediate action. 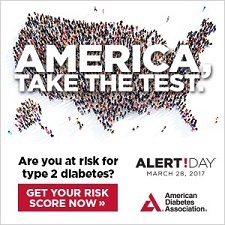 Please make sure to mark your calendar for American Diabetes Association Alert Day on March 27 and take the Diabetes Risk Test Once you’ve taken the test, encourage your friends and family to take it too. Go to Diabetes Risk Test to take the Diabetes Risk Test today. For more information about diabetes and pre-diabetes visit Diabetes.org or LCDHD Diabetes. You may also contact the diabetes educator at your local health department.